Today, we are going to visit a cute little wooden house that features a touch of personality and charm that's bound to pique your interest. Designed by professionals Studio S, this home is a wonderful example of how it's possible to have a very modern and trendy home without it being overtly large or luxurious. As we move towards simpler lives in modern society, this project shows how a more natural look and feel can work in harmony with comfort and, of course, a little bit of a unique edge. From this angle, we can see just how modern and contemporary the home is. 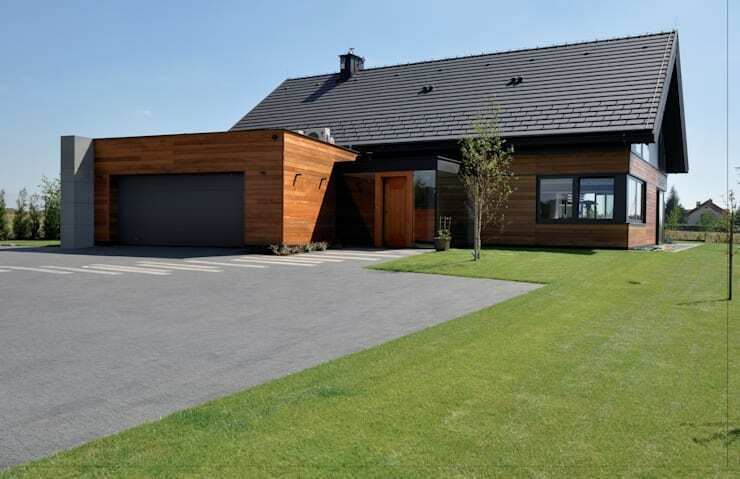 It features a dark wooden facade and dark grey finishes including the roof and garage door. These two colours and tones work in harmony with one another, creating a striking look and feel. There is a large driveway and parking area, allowing family and friends plenty of space for their cars while the double garage keeps the family's cars and bicycles stored neatly out of sight. This contrasts beautifully with the neatly manicured lawn and the refreshing greenery. The architecture is a wonderful example bringing warmth to what would have been a stark modern facade. The very unique facade merges a traditional gable roof design with a very modern shape, as we can see clearly in this image. We can also see how windows and doors are interspersed throughout the facade, offering a wonderful connection between interior and exterior spaces. A large sliding door allows the bottom level of the home to spill out onto the garden, while the upper level features large windows, which ensures sunlight streams into the home. Skylights have also been included in the roof, offering the family privacy and natural light at the same time. The exterior gate is a fabulous example of the charm and personality that exists when it comes to this home. 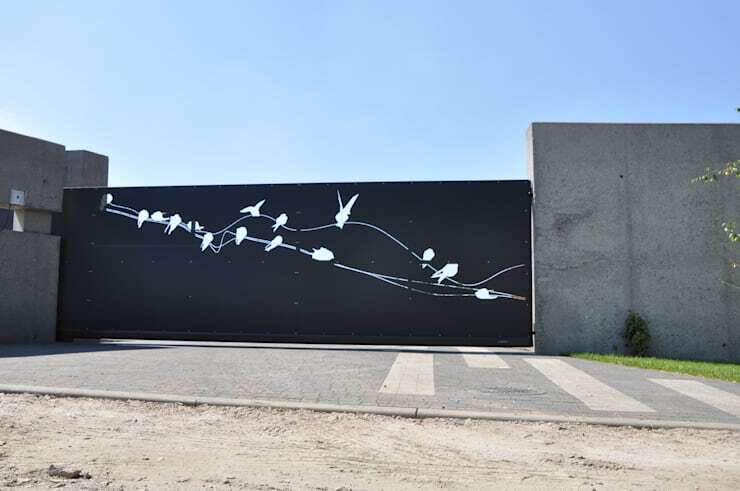 A simple iron gate has had a bird design cut out of it, making for a very unique and appealing design. It also gives us a little glimpse into the personality of the home owners. Do you see how you can be creative about even the most functional of elements? If we head inside the home, we can see that there is an open plan design where all of the rooms interact with one another. Wood plays a prominent role throughout, bringing a warm, earthy and slightly rustic touch to the interior design. The wooden floors and furniture work in harmony with the sunshine that streams in through the large glass windows and doors. 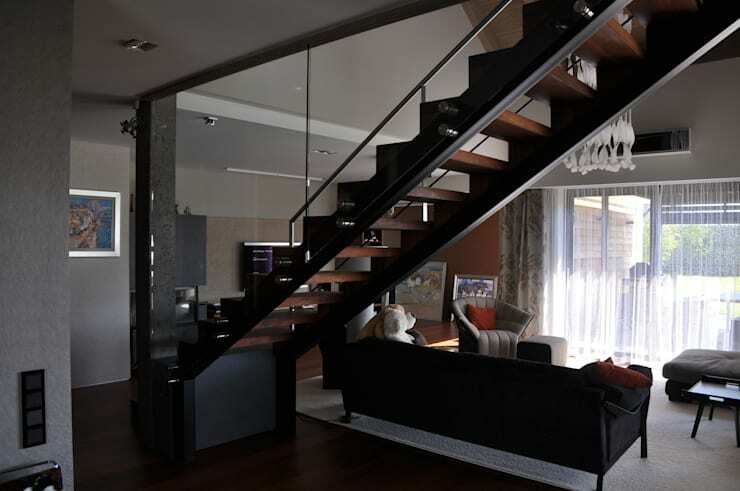 The staircase is another great example of how functionality and style can collide! Don't you love how artwork has been used to introduce personality and charm to the space? The dining room interacts with the rest of the living space and opens up onto the terrace. This ensures that the family can chat to the chef while he or she cooks in the kitchen or keep an eye on the kids while they play in the garden. This dining space shows how simple can be the most effective. A wooden table and white chairs are enhanced by subtle touches of decor included patterned place mats and a pot plant. A stylish lamp drops down from the ceiling, creating another balance between functionality and design. Tip: Add a vase of flowers or a pot plant to any room for a natural splash of decor. 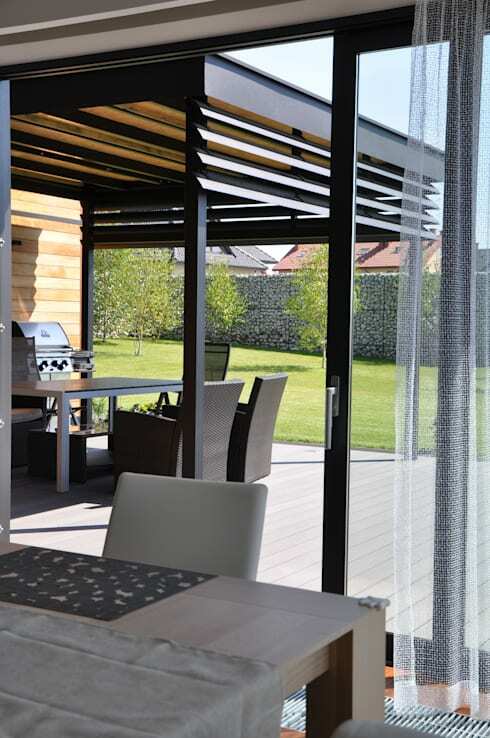 Here we get a closer look at how the interior space opens up onto a covered terrace, complete with an outdoor dining area, a barbeque and views of the gorgeous garden. This is the ideal summer spot! If you have the space, a terrace is a must. It creates a whole new living area that doesn't need to be kept as clean and tidy as the interior space. It also allows you to interact with fresh air, sunshine and nature. Have a look at these 9 fabulous and super smart terrace ideas for inspiration.